This tutorial will show you how to setup an email account in Outlook Express; we will use standard email account settings, used most of the time by ISPs (Internet Service Providers) or email hosting providers. Thanks to Outlook Express' Email Account Setup Wizard, creating email accounts could not be easier. In as little as four steps, you will be ready to use Outlook Express with your new email account. Skip to email account setup. Outlook Express is the most widely used email program worldwide. Part of if comes from the fact that it is free, bundled with Internet Explorer for Windows, but part of it is also its quality and flexibility: you will be able to setup nearly any kind of email account in Outlook Express. This tutorial shows you how to create a standard email account in Outlook Express. To setup Hotmail in Outlook Express, please see Setting Up Hotmail in Outlook Express instead. To ensure that Outlook Express will be able to connect to your email account, check the email account settings below, needed to set up new email accounts in Outlook Express. Standard email account settings are: user name and password, email address (sometimes used as user name as well), "port" numbers (nearly always the ones we use in the sample email account below). Although rarely, some email providers require "secure authentication": Outlook Express would then use a secure (encrypted) connection to authenticate itself to the email server. If you are trying to setup your Hotmail account with Outlook Express, please see instead our Setting Up Hotmail in Outlook Express tutorial. If the new email account wizard opens automatically, simply proceed with the new email account setup below. The Internet Accounts dialog will open, and display all accounts (email and other) you currently have setup in Outlook Express. The Internet Accounts dialog is the central location from which you can add, remove, or modify email accounts, as well as import or export email accounts in Outlook Express. The Internet Connection Wizard will open. This wizard will guide you through all the steps needed to setup an email account in Outlook Express. The first field is the Display Name: type in it your name, as you would like it to appear to recipients when you send emails from Outlook Express. This information can be changed later on, after you have finished setting up your email account. Click the Next button to proceed with the creation of your new email account. The wizard's second screen, Internet E-mail Address, allows you to enter your actual account's email address. Your email address, as it should be entered, is composed of two parts: the "user name", which is the part that comes before the "@" sign, and the "domain name", which is the part that comes after the "@", like yahoo.com, hotmail.com, aol.com, etc. Most domain names are simple, like "email.com", but there are cases when it is normal to have multiple periods in your email account's domain name. Such an example is governor@state.tx.us. Your email address will also be used by Outlook Express as your email account's user name, but this can be changed later, from the email account properties. (Outlook Express automatically uses your email address as user name because most email providers follow this convention.) — Click Next to configure your email account's mail servers. In the E-mail Server Names, Outlook Express collects the incoming and outgoing email server names, and the type of email account you try to setup. mail.emailDomain.com is the most common form of mail server name, where emailDomain.com is your email provider's domain. In most cases, these will contain your email domain name. In some cases, your email provider may ask you to use an "IP Address", which Outlook Express will also accept. The most frequent type of email account is POP3, which is a "protocol" -or language- that Outlook Express uses to communicate with your email server. Outlook Express also supports IMAP and HTTP. IMAP is very similar to POP3: the main difference is that the folder you create in your email account are also created on the email server. With POP3, different folders can be created in Outlook Express and on the mail server. Outlook Express uses HTTP for the two Microsoft webmail services: MSN.com and Hotmail.com. 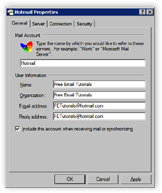 Outlook Express can also use HTTP to connect to other webmail services, but most of these will use POP3. This is why, if in doubt, POP3 is the best guess to setup your email account in Outlook Express. In most cases, your incoming and outgoing mail servers are mail.email.com, where email.com is your email account's domain name (the part that comes after the "@"), that Outlook Express will use to "talk" with the email server. Click the Outlook Express Email Account Setup Wizard's Next button. The Internet Mail Logon is Outlook Express' last screen in the creation of a new email account. In the Account Name field, Outlook Express lets you give a friendly name to the email account you have just setup. "My AOL Email" or "Hotmail" would be examples. Outlook Express will display this email account name, and use it whenever it refers to it. In the Password field, Outlook Express is requesting the password needed to access your email account. Outlook Express can optionally remember your email account password for you. This will spare you from having to type it whenever Outlook Express checks for new emails on the server. You should only use this option if you trust others having access to your computer, or if you can lock Windows while leaving your computer unattended: if others can access Outlook Express on your computer, they will be able to control your email account. By default, Outlook Express will use your email server name as "friendly" name for the email account you just set up. Especially if you intend to setup multiple email accounts with the same domain (multiple Hotmail accounts for example), you will want to override Outlook Express' default email account name, and type your own email account name instead. Congratulation - you have setup an email account in Outlook Express. You have just created a new email account in Outlook Express. The email account settings you provided during the email account setup are nearly always enough for Outlook Express to connect to your email account. Sometimes however, email providers have special email accounts settings. If Outlook Express cannot connect to or download emails from your new email account, we will add an Email Account Settings in Outlook Express tutorial soon.